I slept fairly well, and was pleased that I heard almost no sounds from the adjacent rooms. After being spoiled by the superb soundproofing at Animal Kingdom Lodge last January (I slept right through all the marathoners getting up before dawn), I was concerned that an older, less expensive resort might be noisier. I got my wakeup call from Mickey and Stitch at 8:40 a.m. (5:40 a.m. Pacific Time--ugh!). I drove down to the main complex (because I would be heading out in the car after breakfast) and checked at Holiday Station, a special Guest Services window set up at this time of the year, to find out whether I could pick up my Mickey's Very Merry Christmas Party ticket. 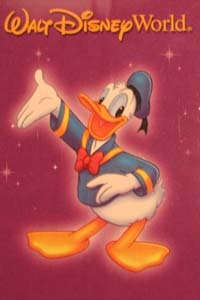 I couldn't, but the CM offered to let me pick up the Candlelight Processional Dinner Package tickets for my group. I decided to leave that for Mindy, who will be arriving on Monday, since she's the one who made the CP arrangements. While I was there, I had the CM check for my missing Priority Seating bookings. By using my home phone number instead of my name, she was able to find them all. They had been listed under a misspelling of my name. Something to remember for the future if I have PSs go missing again! I browsed Fulton's General Store for a few minutes, jotting down some ideas for possible take-home gifts. By now it was nearly 10:00 a.m., and I was supposed to be at Give Kids the World Village by 11:00, so I went over to the Riverside Mill food court and got a yogurt and granola parfait. There were also some banana slices, so with grain, fruit, and protein, it was quite a complete breakfast. 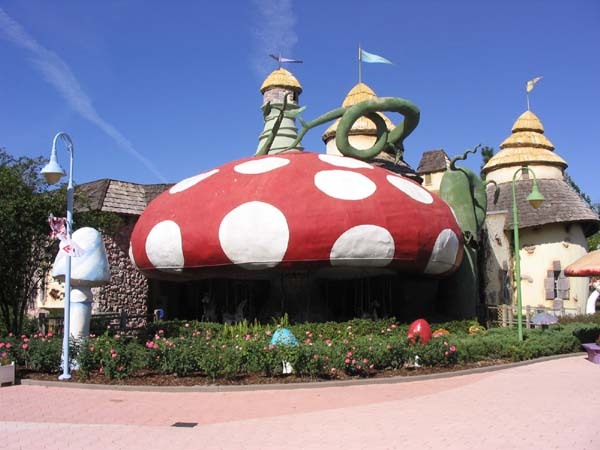 I then drove through Kissimmee to Give Kids the World Village, which is an amazing place. 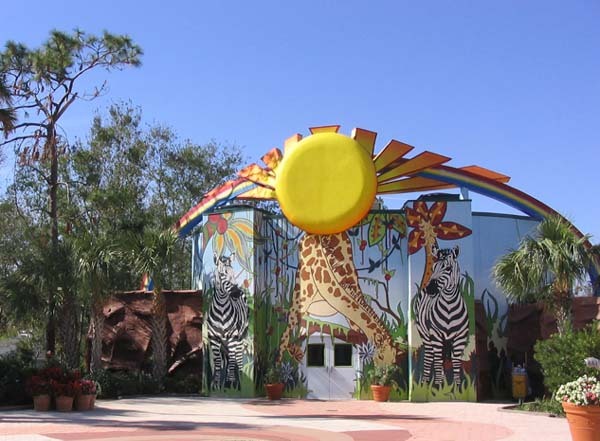 On a practical level, the village gives children with life-threatening illnesses and their families a convenient, supportive place to stay during their free week-long Orlando-area vacations. 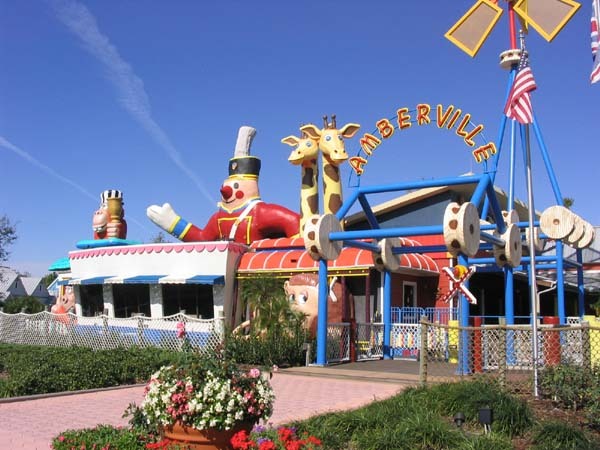 On a psychological level, it's an absolutely delightful village obviously designed with love to make the experience a positive one for all involved. Architects and artists from Disney, Universal, Sea World, etc. have created some of the most magical buildings I've ever seen. CFO Tom Levesque gave me a great tour of the village. First we took an electric cart to drive around the whole complex and to visit one of the unoccupied cottages. Each one has two bedrooms, two baths, a living room, and a kitchen. At least one of the bathrooms is set up for wheelchair access. The cottages are pretty basic on the inside, but there are some whimsical touches such as multicolored ceiling fans and Mickey Mouse telephones. While we were driving through the residential area, a bunch of volunteers were going house to house putting up Christmas decorations. 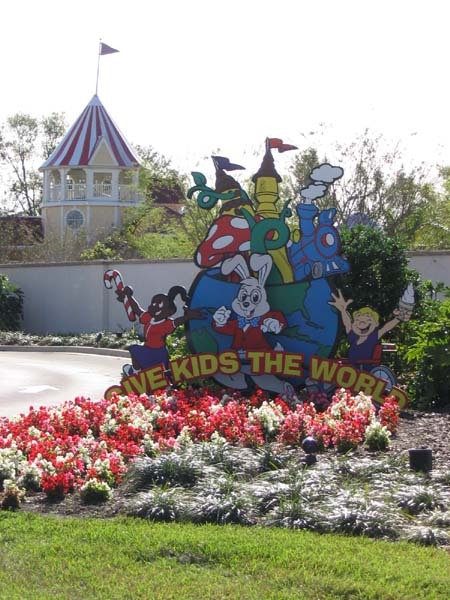 GKTW has an amazing corps of volunteers who help make families' visits a wonderful experience. 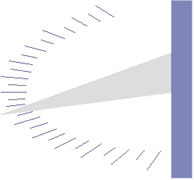 In fact, there are about 1,000 volunteers who work once a month or more. 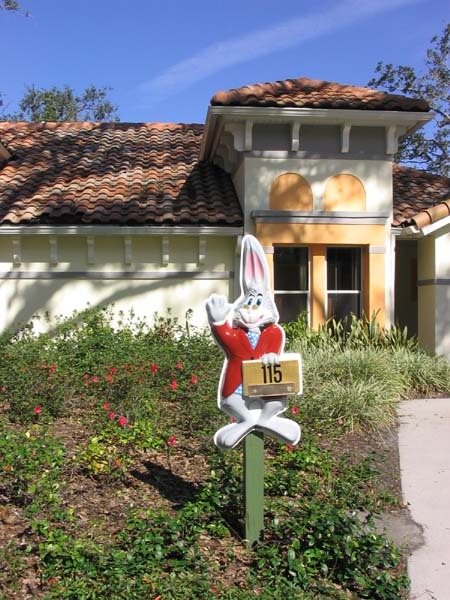 As you can imagine, GKTW often has requests from more families than it can house. Luckily, local hotels have been very generous in helping with that. 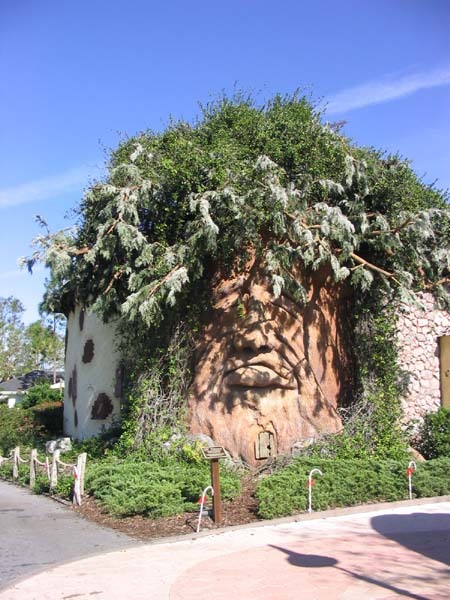 For example, Disney routinely puts up families at some of its deluxe resorts. 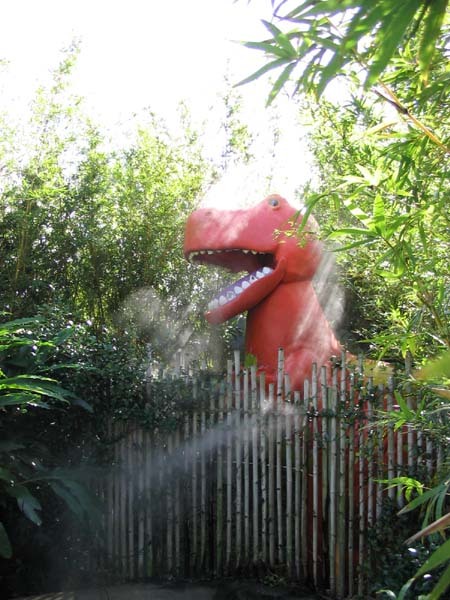 The local theme parks also help with other things. 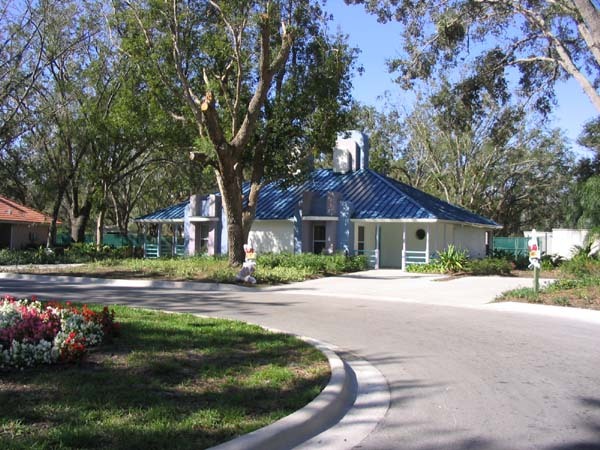 Some of them sent landscape teams to the village after the 2004 hurricanes to remove downed trees and plant new ones, so the complex looked very nice again by the time I was there in early December. Gingerbread House. This is where families can get breakfasts and dinners. It's a charming pastel building whose annex is topped with a giant cupcake. 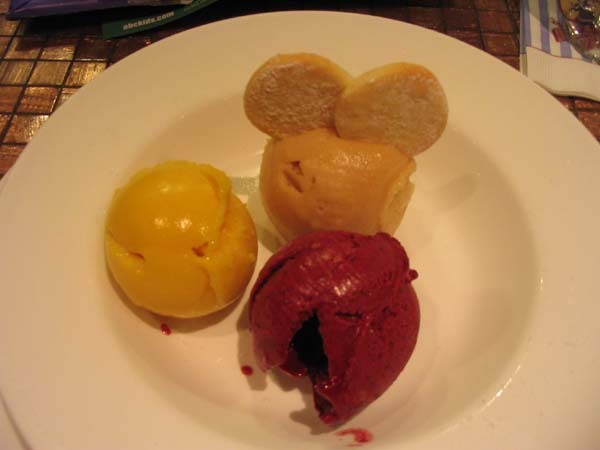 The restaurant is operated free for GKTW by Perkins Restaurants. 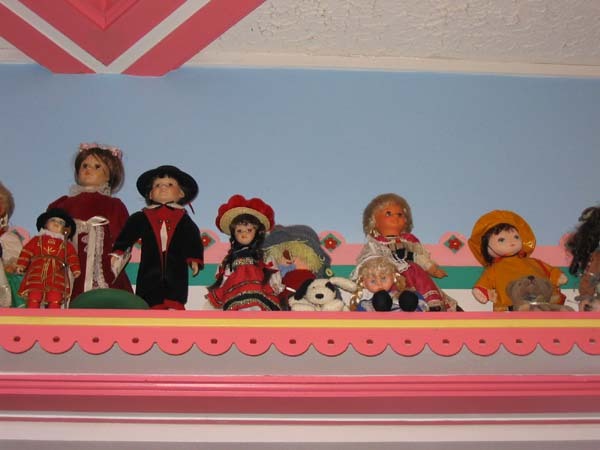 The rafters inside are filled with dolls that have been sent by families who've visited GKTW. 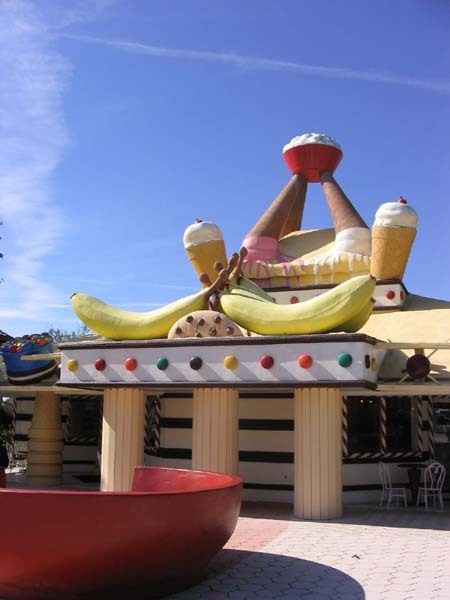 Ice Cream Palace. Every kid's dream--free ice cream from morning till night! Claytonburg Park of Dreams. (Named after the "mayor" of the village, a rabbit named Clayton. He's on the entrance sign as well as the house number signs, and there's a statue of him in this park.) This area has the main pool, some other water-play equipment, and an amphitheater for outdoor events. 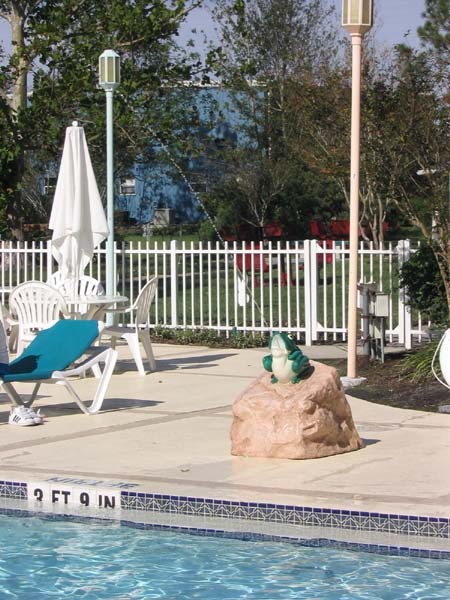 The pool has some cute squirting frogs. The Castle of Miracles. Outside, you see (and hear) Ol' Elmer, a tree who snores. 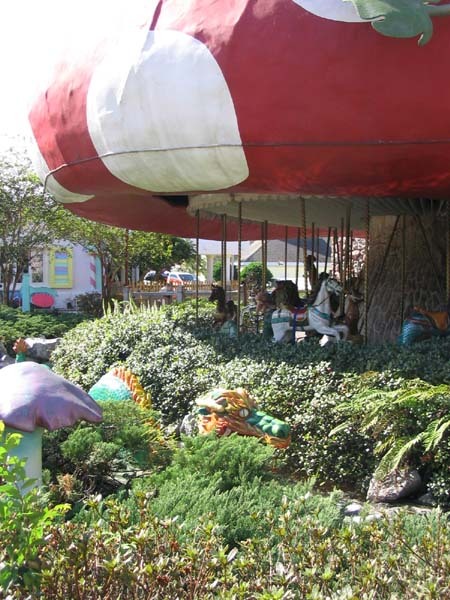 A giant red-and-white mushroom covers a small carousel built in the Netherlands that includes a snail and a turtle where wheelchairs can be strapped in. A knight in armor says hello as you walk in the door. 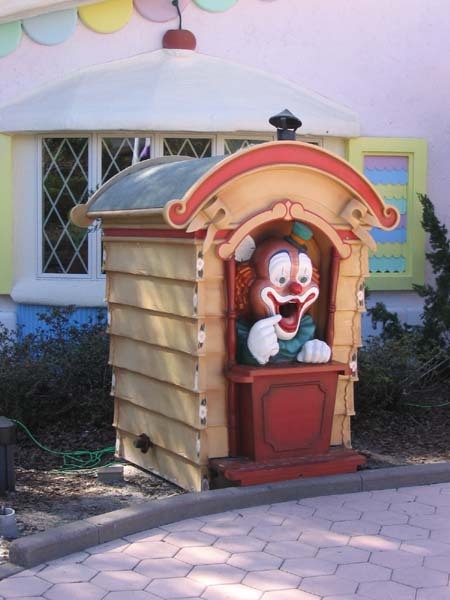 There's a throne, a toy room for younger children, and the "roots" of Ol' Elmer to climb through. Amberville Train Station . This building has an extensive model-train layout. There's also a room with video games, and outside, some remote-control boats. Julie's Safari Theatre. 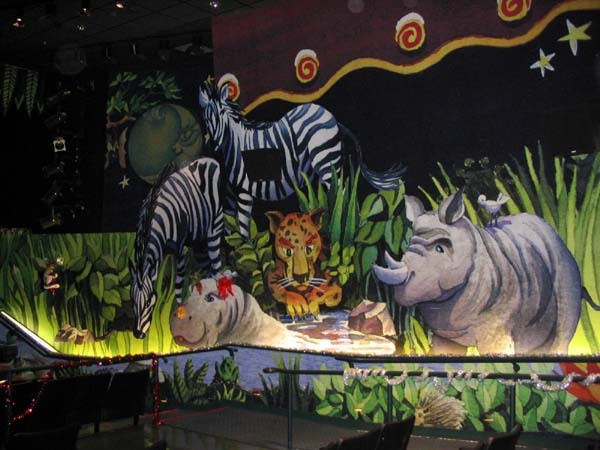 A movie theater with African animal murals inside and out. The chapel. 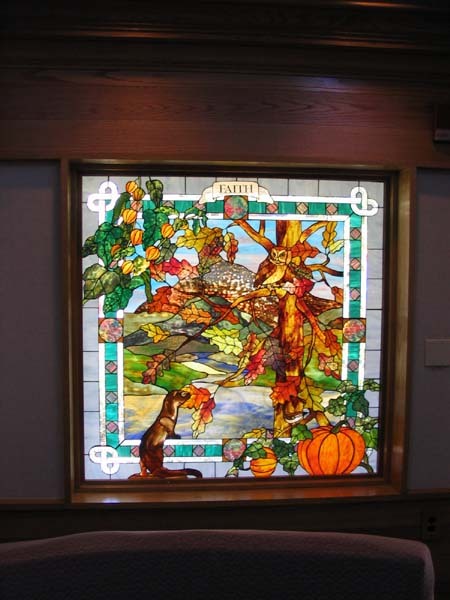 It has beautiful stained-glass windows illustrating such concepts as peace and faith. 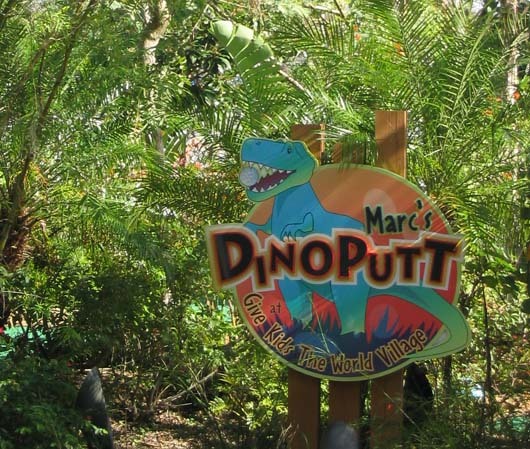 Marc's DinoPutt, a miniature golf course with a dinosaur theme. 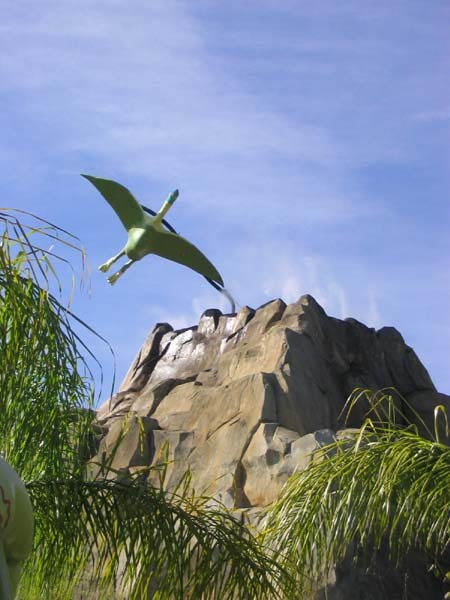 When balls go through a dinosaur or fall into the hole, something happens: a sound is triggered, a dinosaur rears up, etc. There's even a primordial mountain with a pterodactyl circling over it. 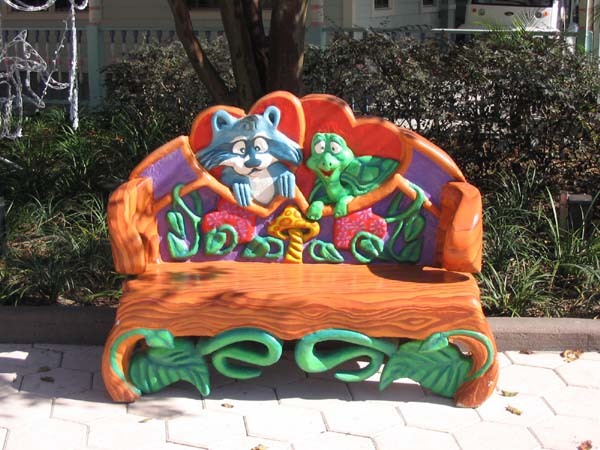 There are also many other delightful touches, including talking trashcans and playful benches. I left GKTW about 2:00, fed the car, dropped it off at the Alamo/National office at the WDW Car Care Center a little before 3:00 p.m., and got a shuttle bus ride back to PO-R. 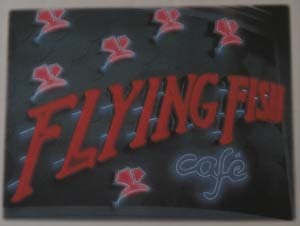 I arrived about 20 minutes early for my PS at the Flying Fish Café, but was seated almost immediately. As I had requested, I was given a seat at the counter, where I could watch the action and chat with the chefs while dining solo. Because of the noise from the fan vents over the cooking areas, it was kind of hard to talk, but I did a little bit, when they weren't too busy. There are seven seats to the left of the grill, and five more at the other end. The ones on the right are quieter because that area is farther from the fans, but there's only one underchef there to talk to. The photo here shows the view from the lefthand counter seats. The chef working near me was Joanna. I saw her do everything from venison to a grilled cheese sandwich. 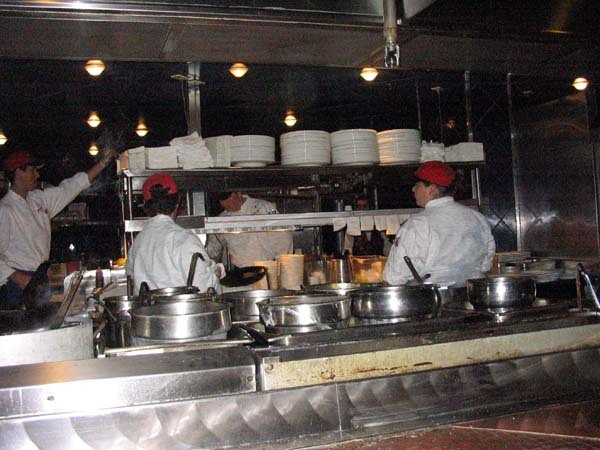 Rudy was working the oakwood-fired grill, making mahi-mahi, salmon, steaks, and chicken. Waiters Joe (a Florida native) and Mikael (from Armenia) took great care of me. Joe showed me around the restaurant, pointing out the Coney Island mural (complete with hidden Mickey) and the Caba��a Room, a small semi-private side room in the restaurant. Joe has worked at the FFC since it opened about eight years ago. He says that many of the other servers have also been here for a long time; they really like working here. At one point, Mikael brought Jens Dahlmann, the head chef, to meet me. Jens is originally from D��sseldorf, Germany. He was working elsewhere in Florida when Disney hired him, and has been the head chef at the FFC for about seven months now. I asked him how often the menu changes; he said the crab cakes, potato snapper, and steak are standard, but even still, he can play with their recipes. The rest of the menu is adjusted seasonally. I finished dinner about 7:30 and took a boat over to the International Gateway, where I exchanged my voucher for a Premium Annual Pass. An exciting moment! After entering Epcot, I started looking for a lanyard with a plastic holder where I could store my AP. I found a pin cart at UK that had only one lanyard style with a pouch, and it didn't excite me very much. The lady at the pin cart said there might be more selection at the main Epcot pin station near Spaceship Earth, so I headed that way. As I left World Showcase, I stopped to sit under the Lights of Winter for about 10 minutes, listening to the music and watching the lights and the FutureWorld fountain keep time with each tune. I got to the pin station a little after 8:00 p.m. They just had the same lanyard style I'd seen at the UK, so I went ahead and bought one. As I was browsing, another customer came up and asked the CM about passholder exclusive pins. Since I'm new to the AP world, I'd forgotten about those. He had ones for Epcot ("Holidays Around the World 2004") and D-MGM ("The Little Mermaid"), so I bought those along with the lanyard. At about 8:40, I headed out of the main entrance of Epcot and took the bus back to PO-R. When I got back to my room, the first pin I put on the lanyard was one I'd been given at GKTW--a place of honor on my lanyard for a very special place. Then I added the KSC, Epcot, and D-MGM pins. If I can get one holiday or passholder pin for each of the parks, plus a few more special ones, I'll consider my pin-hunting complete. Text and photos (c) 2004-2006 Patricia F. Winter, unless otherwise noted.